Does your old carpet need some upgrading? 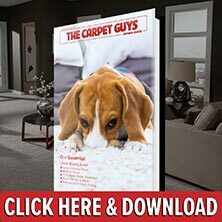 Set up a free carpet installation estimate with The Carpet Guys today. We have the best carpet installers in Ray Township on our team, and they are ready to renovate your home. We know that buying new carpeting can be an expensive investment depending on who you work with. With The Carpet Guys, finding cheap carpet is not as difficult as you think. While our products are not cheap quality, the pricing is. We carry the most sought-after carpet styles on the market with prices that will leave you speechless. If you want to get carpet installed the easy way, schedule your free in-home estimate with us today. New carpeting is within your reach. When our installation crews arrive at your home, they will begin by moving the furniture out of the rooms free of charge. After the furniture has been taken out of the room, they will then tear up the old flooring for you as well. It is bundled up neatly and placed outside by the curb. This is when the new carpet padding is rolled out. The carpeting you chose is laid on top of the pad and installed. After the install is complete, the remnants are removed and the furniture is placed back into the rooms. Ready to start renovating your home with The Carpet Guys? Get your free estimate set up today. Our installers are standing by, ready to put new carpeting on your floors. We look forward to serving you.